Daniel Licht composed the perfectly creepy, eerie and haunting music for the Dexter show. The Silent Hill series is one of the few game franchises that is known as much for its music and sound design as it is for its gameplay. Akira Yamaoka’s haunting score is legendary in the gaming world. Fans of the series know the main theme immediately upon hearing the first notes strummed on the mandolin. When word came down that Silent Hill’s 8th entry, Downpour, would feature a new composer, long-time fans of the series were more than a little nervous. Konami handed over musical duties to veteran composer Daniel Licht, known best for his work on the “Dexter” series. 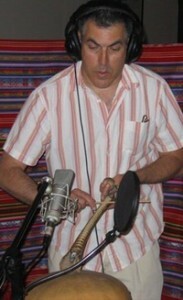 His experimental use of…uncommon percussion on “Dexter” (where real bones were used for some pieces for example) and overall strength of the compositions used there calmed many nerves about Silent Hill’s musical future. Dread Central recently got the chance to ask Daniel Licht a few questions about his work on Silent Hill, “Dexter” on Showtime, and beyond. Mr. Dark: Downpour is the first game you’ve worked on, and it’s the first game Vatra has developed in the Silent Hill series. How involved was Konami in selecting you for the music vs. Vatra, and how involved have they been in guiding the creation of the music? Daniel Licht: Konami first approached me, but I’m sure Vatra was involved in the decision as well. I have been talking with both creatively in terms of the direction of the music I have been writing. MD: Vatra is a Czech developer. How closely have you been working with them, and what challenges have you faced working with an overseas company? Daniel Licht: I have been working closely with the people at Vatra. Even though they are overseas, we communicate regularly over the phone or internet. MD: Silent Hill has been all over the map when it comes to tone and level of emotion over the series. Some entries, like Silent Hill 2, are extremely dark and emotional journeys, while others, such as Silent Hill: Homecoming, are mostly exercises in horror and combat. What kind of emotional tone does Downpour take, and how did you help that come through in your score? DL: It seems to me that the sound of the game has always been a mixture of dark emotional music mixed with horror. Downpour follows in that tradition, and I am in the process of writing music with a range of emotions, highlighting a sense of loss as well as a sense of fear and impending horror. Daniel Licht couldn’t have written the music for Dexter any better than it is. I look forward to hearing his other composing projects!